What is the most basic food you can think of? Well, bread is perhaps one of Europe’s most basic foodstuffs. And in Spain it is indeed something which has been central to daily life for centuries and even today is served with every meal. 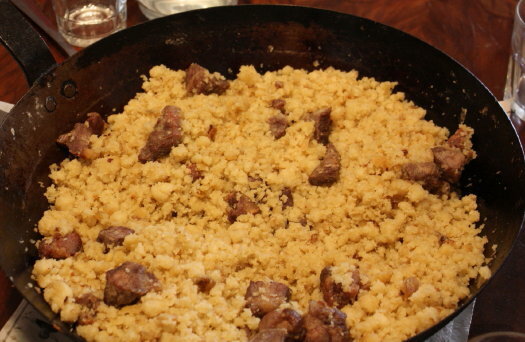 But if we are talking basic recipes,really basic, then a dish called “Migas”(literally crumbs) is perhaps one of the most basic, simple dishes in Spanish gastronomy. 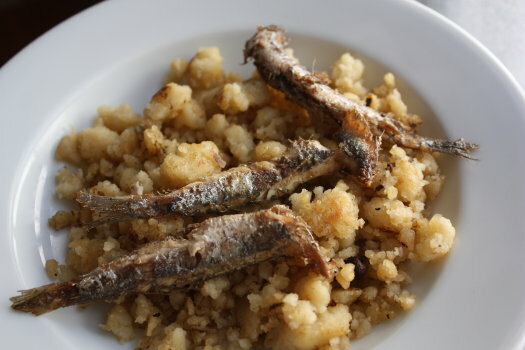 A stalwart of hard times and poverty stricken rural communities in Spain over the centuries it is a dish which is simple but surprisingly difficult to cook well. 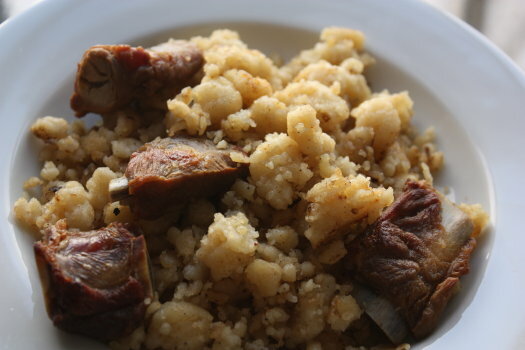 Broadly speaking,there are two types of “Migas”(well there is a third made from wheatflour but it is not very common). One is made from day old bread which is broken up and fried into a sort of breadcrumb mass in olive oil(often with garlic) to which can be added dried sweet peppers, meat,etc. This version is popular in central and western Spain and can normally be found in most parts, and most especially in rural areas. To be honest, I have tried numerous examples of this version and there are some very nice dishes out there but there are also some terrible versions which are often sold in touristy spots as authentic local food and unfortunately give this dish a very bad name. The key,as in most dishes, is quality. If you use crappy old bread, too much (or tainted) olive oil then the crumbs get very greasy and lose their culinary charm. This recipe is easy to make but not so easy to make well so to find a good version you must suffer the lesser quality versions before you find a good one. Or get a recommendation for a good place to try it. 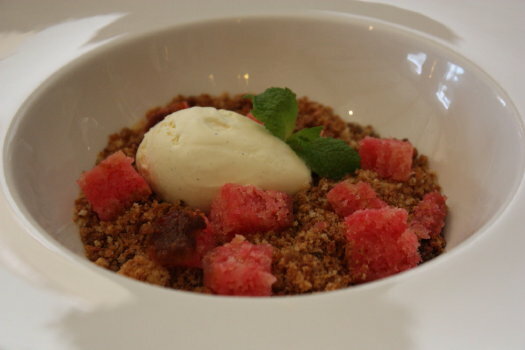 The other way of making this great dish is to start with the ingredients in primary raw material state. So flour,salt,olive oil and water. Well mixed you then heat the mixture in a large very deep special pan so common in southern Spain and especially so in Murcia where “Migas” is virtually the flagship dish of the region. This type of pan has a metre long handle for cooking over an open fire or a large gas paella ring. The mixture is like a slightly oily dough and at this point you have to continue moving this doughlike mixture of flour water etc over a steady heat until it starts to break up into small blobs and then into even smaller crumbs of roughly the size of a 10 cents coin and slightly smaller. It is hard work separating this dough as you have to continually work it with a metal spatula type instrument and your arms start aching so it not a dish for slackers! Once you can see that the crumbs are well separated then it is tasting time to see if they are properly cooked through. At this point you can add previously fried pork ribs or sardines. 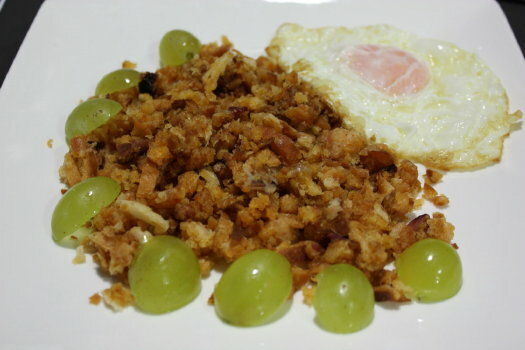 “Migas” of this type can be eaten with fried pork ribs,with fried egg,with grapes, with sardines, with boquerones and much more. Some people love to eat them with chocolate. I have heard that some people even eat them with sardines and chocolate together but this I have not come across yet. Whichever way you try “Migas” I can recommend the Murcian style ones with pork ribs or fish as the taste is unique and the experience a fun social one as everyone eats out of the same pan round the table, politely eating from the area of the pan in front of them. A little like eating paella from the pan. It is a communal and interactive way to eat a meal,making the whole experience memorable and a familiar affair. Whenever, we have “Migas” in our household or my inlaws’ household, it is one of those days that when you cross with someone in the house during the morning, the comments are of the following ilk: “Migas today!” “Know what’s for lunch today? (Big smile)” etc. If you get the chance, then this is a must try dish and one that harks right back to the roots of Spanish rural life and the basics of the agricultural community which for centuries hardly changed: water,wheat,the olive,salt and the pig. The Spanish Thyme Traveller sells cool and original Spanish food and drink brands from our base in Valencia. This entry was posted in Spain and tagged Culture, Family, Food, food experience, murcia, social eating, Spain, spanish dishes, spanish food, spanish recipes, Spanish regional food, spanish rural food, Traditions by Paddy Waller. Bookmark the permalink. Hmm the combination certainly doesn’t sound good! Thanks for the kind words Robin……..
Until a fortnight ago I had only heard of the ‘day old bread’ version but was delighted to be invited to a mass-migas-making-session during my visit to the Alpujarra, where they made the ‘raw ingredients version’. I was very impressed with the technique and apparent ease with which the local women kept the stuff on the move – especially in the high temperature! A sweet version? Not so sure I’d be too keen to try that! I had mine with pork belly, jamon, peppers and boquerones. I enjoyed it, but don’t know if I’d order it above seafood or a juicy steak. Glad you enjoyed your version Elle.Thanks for commenting! I can honestly say I’ve neither eaten them, or seen Migas on a Menu. I must be dining in all the wrong places. I’m sure if I attempted them at home myself i’d end up with nothing more than something that looked as though it should grace a full English breakfast. As a new resident of Valencia (from the U.S.) I’m thrilled to discover your blog. Thanks for the introduction to so many beautiful aspects of life in and around the city! Hi Judith, Thanks for dropping by and commenting.Gald you enjoy our page. We had a Migas competition here in Órgiva as part of the recent feria. Spanish took it very seriously, others (er…expats) an excuse for a party!